Let’s go on a little ride looking for restaurants. We’ll start in Timonium and what do you know, I found one. It bears the fancy name of IL Basilico Trattoria Italiana and you can find it at 29 West Aylesbury Road. That’s the Fair Grounds Shopping Center, home of Shop Rite. It’s open seven days for lunch and dinner. There’s seating for about 80, with a small dining area outside. There’s also plenty of free parking. They have an open kitchen if you want to watch the cooks. I prefer just tasting what it is they prepare. I asked Anna, the owner, who happens to be from Naples Italy, about the signature dishes. The contemporary one is Paccheri with shrimp and zucchini. The one she calls traditional is Mamm’s Pia Neapolitan Ragu. The signature Italian dishes include the Scialatielle (from the Amalfi coast), the Pappardelle and the Lasagna. Many of the pasta dishes are made there, as is the Italian bread and some of the desserts. Those desserts include the tiramisu and Anna’s almond cake. Superb I might add. 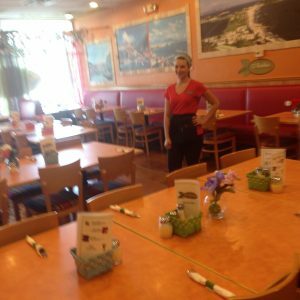 They cater on and off premise, carry out for sure and definitely casual. And yes that do offer pizza. 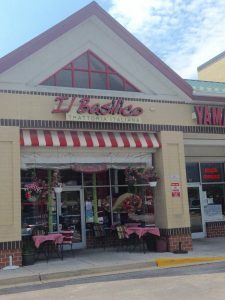 You can reach them at 410-453-6603 or go to ilbasilicotrattoria.com. By the way, if Anna’s mom, Mama Pia, is there be sure to say hello. She doesn’t speak much English but you’ll love her smile. Okay let’s depart Baltimore County and head to Anne Arundel County: Annapolis. Now here’s a restaurant I heard so much about that I had to investigate. 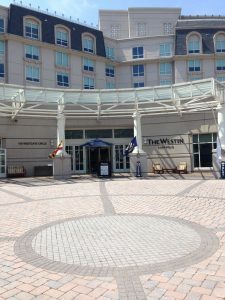 It’s Azure (Spanish for blue) in the Westin Annapolis, 100 Westgate Circle, about a mile from the harbor. Open for all three meals, you’ll find Azure on the lobby level. The menu changes seasonally. I enjoyed the crab cake which I have to believe remains on the menu year round. The chef, Kurt Peter, told me two other signature items would be the shaved pork sandwich and the seared scallops, which is an appetizer. I would describe Azure as modern in style with an attached lounge and bar. In the colder months there is a fireplace to warm the night. There is a private dining room and they cater to larger groups off premise. By the way, before I forget, the crab meat is only Maryland crab meat. That includes the winter. I believe the same is true for the oysters. One interesting menu item is the build your own salad. There’s 31 choices so you aren’t limited in selection. There are also lots of choices for dressing. One of the great things about dining here is that the town of Annapolis is at your disposal. Turn left, walk about a mile, and you’re at the Annapolis waterfront. Of course along the way you can stop at numerous attractions, the State House for one. You can reach Azure at 410-972-4300 or go to westinannapolis.com and click on Dining.